ELVIS AND ALL THOSE ROCKIN' CATS from Memphis certainly kicked off the rockabilly phenomenon in a big way back in the mid-1950s, but I imagine that before too long every hamlet worth its salt could boast a greasy side-burned hillbilly rocker or two. The towns of the Pacific Northwest were no different, and, as elsewhere, much of the early rockabilly action occurred on the fringe of the country/western music scene. The C&W circuit in Oregon, Washington, Idaho and Montana was based on Saturday night grange-hall dances, downhome live local radio broadcasts, and on what may be to some readers, a surprising number of Northwest singers and musicians of considerable talent. To hear old C&W fans tell it, the Northwest enjoyed an incredibly rich scene in the 1950s. There was a point when local fans could have gone to hoedowns held in area halls and danced to the singing of Buck Owens, Loretta Lynn, or Willie Nelson – and not from records on some jukebox! All three of these stars lived and worked in the Northwest. In the late-‘50s Owens ran dances in Tacoma, Washington, and hosted a radio show on station KAYE, and cut a few singles in Seattle. Meanwhile, Lynn lived in Custer, Washington, got a guitar in Seattle, and recorded her classic debut 45, “I’m A Honky Tonk Girl” (Zero Records 107), for a local label. Nelson kept busy singing at area dances, working as a C&W deejay at radio station KVAN in Vancouver, Washington, and in 1957 recorded his now-ultra-rare debut 45, "Lumberjack," in a tiny studio in Portland. There were also a number of less-famous local names who cut interesting recordings showing a certain wild energy that was rather atypical of traditional C&W music. Ace electric-guitar picker Jack Rivers cut an up-tempo bopper “Navy Hot Rod” (Listen Records 1441), during his Seattle years. Then there was Seattle’s Bill Osborne who recorded his guitar instrumental, “Osborne’s Boogie” for Rivers' label (J.R. Ranch 1424). Though neither of these discs can be considered rockabilly, they sure pointed the way! In 1955 Bill Haley and his Comets first scorched their way through the Northwest’s grange-hall circuit fanning the flames of early rock ‘n’ roll. Then Elvis Presley really kick-started the whole movement on Saturday 28, 1956, when he made his national TV debut on the Dorsey Brothers’ Stageshow. It would seem that a zillion budding rockabillies and rockabelles discovered their calling while watching the tube that particular day. Some of the more notable rockabilly singles released in this region include: Benny Cliff’s “Shake It Up Rock” (Drift 1441), Bobby Wayne's “Sally Ann” (LJV 101), Ray Gentry’s “Willie Was A Bad Boy” (Maverick 164), Val Volk’s “There’ll Be A Rockin’ Party Tonight” (Rocket / Drift 1050), Sherree Scott’s “Whole Lotta Shakin’” (Robbins 101), Leon Mach’s “You Hurt Me So” (Lavender 1554), Wally Lee’s “Oh No Daddy-O” (Now 1010), Peggy Griffith’s “Rockin’ The Blues” (Now 1008), Leon Smith’s “Little Forty Ford” (Epic 9326), and Clayton Watson and the Silhouettes’ 1958 classic, “Everybody Boppin’” (Lavender 2454). It was Clayton Watson and the Silhouettes from Centralia, Washington, who probably gained the most notoriety of any area rockabillies. Seattle’s KJR radio even billed them for a live appearance as “The First Rock and Roll Band In The State.” But promoting a teen-dance is one thing, and actually pushing the band’s record with airplay is another. Thus, neither Watson nor any other early local rockers ere with much, if any, radio support for their pioneering efforts. As a live dance and concert act however, there was immediate regional success awaiting Watson. The Silhouettes were soon backing most of the top rockabilly stars on their Northwest tours in the late-‘50s, including: Gene Vincent, Jerry Lee Lewis, Buddy Knox, Jimmy Bowen, and Dorsey Burnette. As things turned out both Watson and his pal, Yakima, Washington’s rockabilly guitar-man, Jerry Lee Merritt, ended up touring in 1959-’60 and then recording with their hero, Gene Vincent, in Los Angeles at Capitol Studios. Another interesting saga was that of the trio of boppin’ cats called the Maddy Brothers. Hailing from Snohomish, Washington, a small rural community about 20 miles north of Seattle, the brothers’ first love was bluegrass and C&W music. In 1954 Bob (mandolin), Jim (rhythm guitar), and Tom (lead guitar) Maddy made their public debut in a guest spot at the old Bryant Grange near Arlington, Washington. Over the following couple years the brothers would be further influenced by the hits songs of Elvis and the Everly Brothers. The Maddys were soon hired to play regular weekends at Duffy’s Tavern in the nearby community of Clearview. By this time they had added Bruce “Buddy” Brautsman (bass guitar) to their lineup and occasionally hired one of several drummers to play these gigs. Before long the Maddy Brothers were signed to a management contract by Art Benson, a Seattle-based businessman who was a freelance talent scout. This led to a recording session at Seattle’s Dimensional Sound studio and, in late-1957, a record on its associated label, Celestial Records – a single that was a unique specimen of rock ‘n’ roll to say the least! 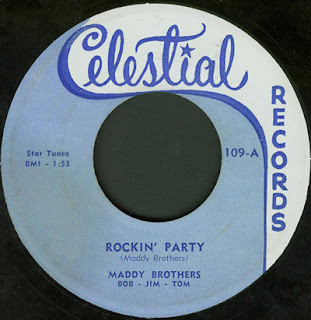 “Rockin’ Party” / “Hey Little Girlie” (Celestial 109) featured some truly gone hillbilly harmonies, those two twangin’ guitars, and one mad mandolin. All of this was served with a big greasy side order of serious slap-back echo. Funny thing is though: the little record rocked like crazy. Especially considering that there are no drums on it! Though the Maddy Brothers’ manager faced an almost impossible task of trying to get Seattle’s deejays to look twice at a local record back in those days, Benson gave it his best effort. He apparently regaled many a local radio station Program Manager or Music Director with pleas to give the 45 a listen. All this without any luck. The Maddys had almost lost all hope. But then, one bright morning they had their radio tuned to one of the region’s early powerhouse stations – a station that featured a popular mid-morning show geared to introduce new sounds to the listening audience. The public was invited to phone in votes to help judge a record’s musical merit. To the Maddys’ utter surprise their “Hey Little Girlie” suddenly was being broadcasted. After accepting plenty of congratulatory backslaps from their workmates they heard the announcer explain that the record had received an outstanding 98% “Potential Hit” rating. This was great news and the guys no doubt felt that they were now well on their way to Stardom, the Ed Sullivan Show, Hollywood, et cetera. But too soon, reality set in. “Hey Little Girlie” was never aired again. [Well, at least until I played the record on my KCMU radio show 30+ years later!] Later their manager explained the facts of life in the music biz to the brothers: though the song showed promise as a popular hit, there was still a little matter of finances that he just wasn’t able to resolve with the station. In other words: the deejays wanted cash as payola to continue airing the record and he simply didn’t have the scratch to do that. So the disc slipped into near-total obscurity – except among us dedicated record collectors. But, by the end of the 1950s the first genuine Northwest rock bands – including the Frantics and Wailers – began to emerge and the era of the rockabillies was all but over. The Maddy Brothers, having had their fling in the rock realm, returned to their C&W roots and after two years as regulars on KOMO-TV’s weekly music show, Evergreen Jubilee, they went back to the rural dancehalls where they gigged together until the mid-1970s when they finally retired.